This is kinda how my day has gone so far. 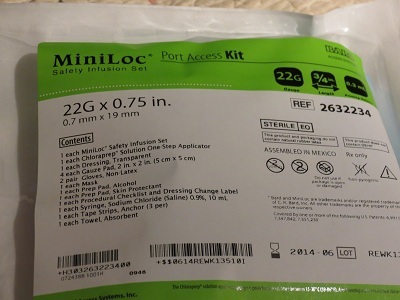 And some of this may be a bit squimish for those who can’t handle medical things… This is a little 101 on port issues and how much of a pain in the nect this one has been to me since I got it. My day didn’t start out too bad for the most part. But I knew today was going to be a busy day because I had to get hubby on the road to California, meet with my home health nurse, go to a funeral and get food. Later on Chuck calls me and wanted me to pick him up because he didn’t end up going out after all . The taking and dropping off hubby went without much fan-fair. As soon as I got home my home health nurse was there. She showed up about 20 minutes early. Which turned into a good thing. The reason why is because they had to change the needle for my portacath. Each week they have to do a dressing change and change the needle. I try not to go into my medical stuff unless people know me really well. But today was one of those frustrating moments with this port business. Thanks for letting me vent. My home health nurse Janelle was telling me how much I will love this port because there is less of a chance for infection and it is easier to use then the piccline and yada yada yada. Well, let me tell you this, she LIED. With a huge capital L-IED. This port has been nothing but a problem for me. She didn’t LIE on purpose, but still. They put it in and it took the Dr’s and nurses a couple hours to decide if it was safe enough and I was stable enough to have the port put in. But the piccline had to be changed because of the Sepsis. This is not a good infection. Anyhow! They decided to put in the port after much hesitation. They did’t leave it accessed and just bandaged it up for my home health nurse to come and access it. May was that a pain for her and me. But they release me after doing vitals and all the fun stuff. 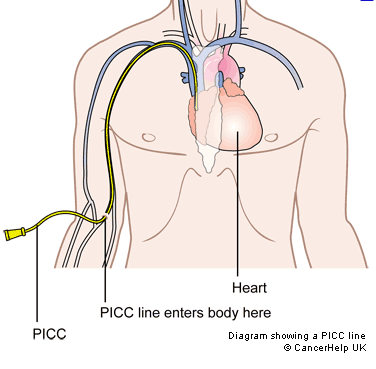 When they put it in, it didn’t really bother me since I have had central lines in the jugular and in the chest wall, picclines and such. They give you happy medicines, so that was the only easy part. Usually I’m not a woose and try not to complain. I just deal with it. My main this is that, this was suppose to be easier and something is telling me it won’t be. With this port tubing is in the jugular vein in the neck and then the port is a few inches below that and then to the heart. The good thing about it being like this and not the central line is that you can’t really tell that it is there unless you look or if it is accessed. A couple days later, the nurse comes out to access it for the first time since I needed my medications. I’m not sure this was a good moment for her, me or the hospital people. As soon as she started to access the line, something went wrong and freaked her out and me out It felt like someone kicked me in the chest for 4 hours. She turned pale white, which kinda made me wonder what was up with that. She got on the phone in a panic trying to reach anyone and everyone she could. Almost had me go to the ER because she was scared. Eventually, after a couple of hours she left and I told her I would call if things got worse. Well! If anyone knows me, I have to be close to dying to go to the ER. The following day we make an appointment to have the port checked out and that is another 4 days away. I go to the hospital where they put it in at and they have to move it a bit because it crossed over where my pacemaker wire was and that was NOT fun at all. It was like HELLO! But they fixed it and got it accessed. 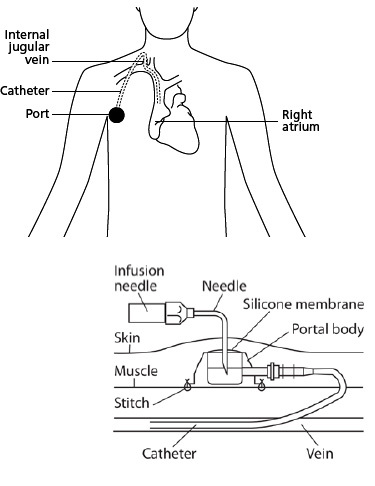 For those who don’t know what that means, it means they have to stick a needle that goes into a special port that goes into the jugular vein and they have to do this each week until I don’t need meds, and then it goes to once a month or so to flush while I’m off IV meds. This was one of the failed attempts… That looks like a bee stinger, not cool! So, now it is two weeks after they accessed the nurse comes out and she opens the dressing change kit with the new needle. For the first kit, they missed and it had major issues and they couldn’t get it to work. Now, they bring out a new kit since they have to have a sterile kit and new needle. On needle two, they hit the right place, but it didn’t go down fur enough so it stopped working. 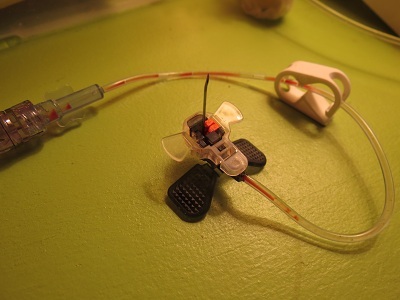 Now, both of the kits to change this dressing and needle are used, so they have to run back to the hospital and they figured out that they needed the longer needle. So now the 22 Gage needles come out and they get the needle in, but when they push fluid in, it isn’t going where it should be going. So I was less than impressed. We have one needle left and finally they get that. The nurses are flabbergasted and tell me that they have never seen this happen before and that they change port needles all the time. My thoughts right now is, ” I do NOT believe that this is easier than a piccline”. 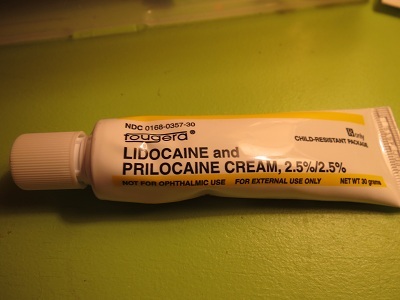 My guess they are thinking the same.The one good thing is that they have a cream that is suppose to numb it. It works for the most part if you get to use it. I finally got to on the 4th needle since the skin was tender. 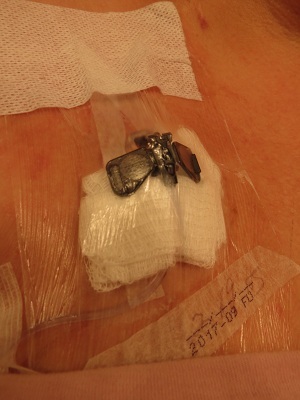 But this whole thing took a couple of hours to change one needle and a dressing. It should have only took 15 minutes and maybe 30 minutes for the whole visit. But nope, 2 hours. I’m trying to be patient, but I had to let them know that we have to hurry, because I have a funeral for a dear sweet lady at my church that is about to begin and I need to leave. They got it in and dressed all up. I leave as they finish. They are still talking outside about how difficult this was. I had to pick up my brother in law for the funeral and we got there just as they were beginning. I try not to grumble and it really isn’t their fault. I’m just thinking this isn’t easier and what a pain in the neck. I feel so horrible for these young kids that have to deal with this and so much more on a daily basis and put their trust in the Drs, nurses and their parents. I am blessed because at-least there is medical care and there are medicines and there are needles that I can complain about that help me do what I need to do. But dang it, they need to figure out a way to know what they are doing. So this is my vent for the day. There was one funny thing. Not everyone may think so and the nurses were dumbfounded on this one. But when they pulled the previous needle, each time they tried to put saline into the line, it would squirt out of the previous hole. I was telling them that water was running down my neck and they couldn’t figure out why since they were just using saline. Then they noticed it and didn’t know what to think about that. I was just thinking it was a me thing. I told them leave it up to me to have water squirting out of holes in my neck, lol. I think they were more concerned then I was, I was thinking it was the only funny thing happening.